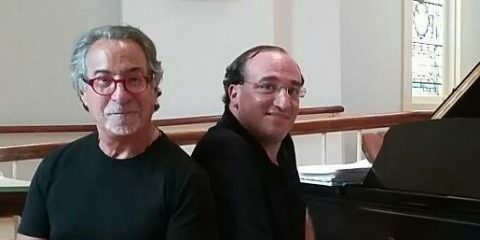 Philip Liston-Kraft and Daniel Weiser team up for another exciting program of twenty fingers on a single piano, featuring music by Gershwin, Moszkowski, Rimsky-Korsakov, Saint-Saens, and more. The Weiser/Liston-Kraft Piano Duo has been described as “simply a force of pianistic energy” who play with “a seamless and tightly knit unity,” and who “absolutely smoke the 88 keys.” They have been bringing their captivating, virtuosic, and high energy performances to audiences across the U.S. for over ten years. Most certainly the only piano duo who both attended Harvard Law School, Weiser and Liston-Kraft bring a flair for the dramatic and a high-wire musical choreography that make their concerts a visual and sonic spectacle. This program will make you want to dance as they perform music by Rimsky-Korsakov, Saint-Saens, Moszkowski, and a new arrangement of Gershwin’s “An American in Paris.” You will not want to miss this thrilling concert! Tickets are available at the door or you can buy in advance below for 10% off. Children are free. Click on the arrow to buy multiple seats. House Concert reservations are required and seating is limited. Buy your seats below. Click on the arrow to buy multiple seats. Or you can call Marcia Colligan, President, at 603-643-3337 if you prefer to make a reservation over the phone and then send a check. Tickets are available at the door or buy in advance below for 10% discount. First Congregational Church members are half-price. Children always free. Click on the arrow below to buy multiple seats or if you are a Church member.